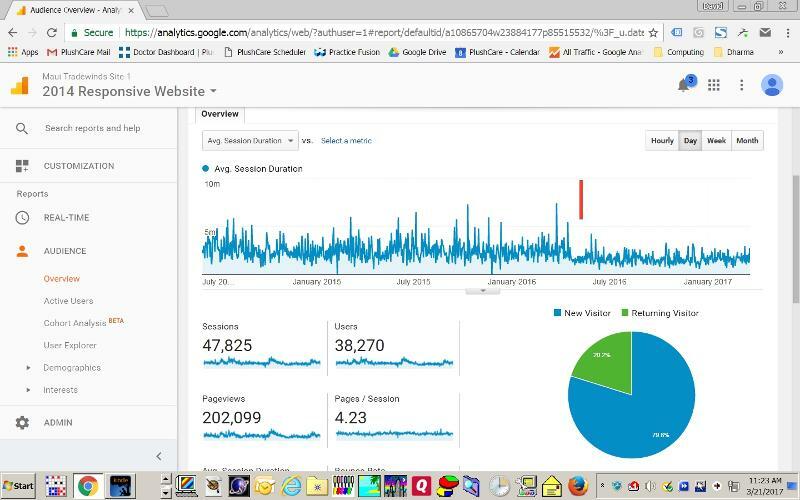 My website www.mauitradewinds.com appears to have had an abrupt decline in session duration around mid-April of last year. From the launch of the site in 2014 until Apr. 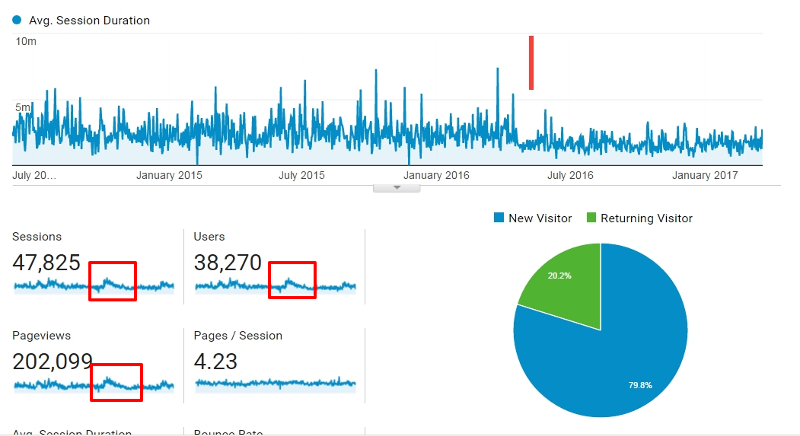 2016, there were 34K sessions with an average duration of 2:30, and 4.3 page views, with a bounce rate of 29.3%. From Apr. 2016 to the present, there were 14K sessions with an average duration of 1:40, and 4.1 page views, with a bounce rate of 29.4%. The site has not change substantially. I am not sophisticated at interpreting Google Analytics data, but it seems that a sudden decline in session duration suggests that visitors are less interested. However, that doesn't seem to match the steadiness of page views per session, and relatively low bounce rate. I'm not interested in overhauling the website, but I'd appreciate some insight about how to interpret the data. Did you begin some sort of marketing campaign (email/paid search/etc) around this time? Did something on the site change? Did you achieve ranking for a new keyword around this time? Keep in mind, a drop in session duration could be interpreted as either good or bad. If you simplified a form for example, and people don't have to spend as much time filling it out, you could have improved the user experience for example. Thank you for pointing out those statistics, which I had overlooked. Since posting the question, I've done additional research. Around the time of the change, our ranking on TripAdvisor dropped, due to a change in their ranking algorithm. We began to have fewer visitors from that referrer, and those particular visitors tended to have the longer session duration. I appreciate your insights.